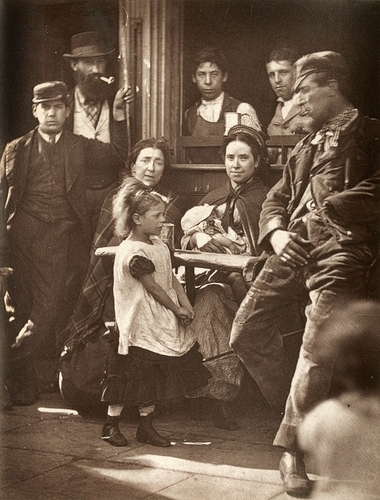 "Thus in the photograph before us we have the calm undisturbed face of the skilled artisan, who has spent a life of tranquil, useful labour, and can enjoy his pipe in peace, while under him sits a woman whose painful expression seems to indicate a troubled existence, and a past which even drink cannot obliterate. By her side, a brawny, healthy "woman of the people," is not to be disturbed from her enjoyment of a "drop of beer" by domestic cares; and early acclimatizes her infant to the fumes of tobacco and alcohol. But in the fore-ground the camera has chronicled the most touching episode. A little girl, not too young, however, to ignore the fatal consequences of drink, has penetrated boldly into the group, as if about to reclaim some relation in danger, and drag him away from evil companionship. There is no sight to be seen in the streets of London more pathetic than this oft-repeated story the little child leading home a drunken parent. Well may those little faces early bear the stamp of the anxiety that destroys their youthfulness, and saddens all who have the heart to study such scenes. Inured to a life crowded with episodes of this description, the pot-boy stands in the back-ground with immoveable countenance, while at his side a well-to-do tradesman has an expression of sleek contentment, which renders him superior to the misery around."